I am so surprised that the painter has painted each and every leaf on the trees in the background. It must have taken such a long time to complete this painting. But it is very beautiful. I searched on Google to find out more about miniature paintings and the people in this painting. I am sharing some of the things that I found . Emperor Akbar was the third emperor of the Mughal Empire, after Babur and Humayun. He was the son of Nasiruddin Humayun and succeeded him as the emperor in the year 1556, when he was only 13 years old. One of the most successful emperors of the Mughal Empire, Akbar also made significant contribution in the field of art. Apart from commencing a large collection of literature, he also commissioned a number of splendid buildings during his reign. Popularly known as a saint musician of north India, Swami Haridas is said to be the incarnation of Lalita Sakhi, a dear friend of Radha. He had a very strong influence on the style of music in north India. He is especially credited with composing a large number of devotional songs and also the Dhrupad compositions. 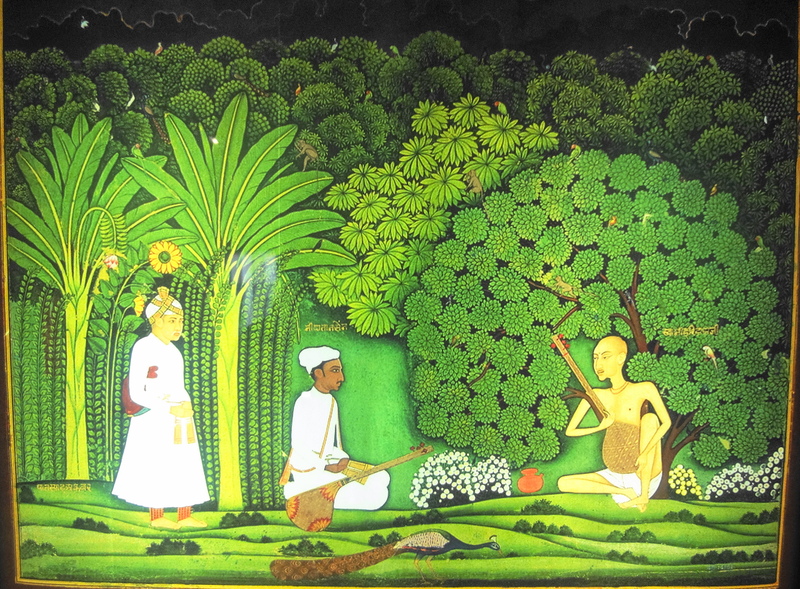 Swami Haridas is supposed to be the Guru of the famous musician Tansen. He also started the Haridasi School of Mysticism that had many students. Considered as the greatest musician in India, Tansen (1506 – 1589) was considered as one of the Navaratnas (Nine Gems) in the court of Emperor Akbar. Tansen was born in a Hindu family in a place called Gwalior located in Madhya Pradesh. His father was a famous poet by the name of Mukund Mishra. Tansen was named Tannu Mishra when he was born. He received the prefix “Mian” from Emperor Akbar. As a young boy, Tansen learnt music from his Guru, Shri Haridas Swamy. He was considered to be a legendary teacher of that time. It is said that Tansen has no equal apart from his teacher. Such was his passion for music that he is said to have performed astonishing miracles merely by singing. He could bring rain by singing in a particular Raag known as Megh Malhar. Similarly he could start a fire by singing in Raag Deepak. He has also composed several Ragas that have been the foundation of classical music like Bhairav, Darbari Todi, Darbari Kanada, Malhar, Sarang and Rageshwari.